In 1290 this West Wales township became the best place in Britain for an ordinary person to live. These benefits shape its history even today. When Laugharne Corporation was created way back in 1290 it must have seemed like Christmas for the ordinary people of the place. They were now free men, they could elect their own leader – hundreds of years before this happened in the rest of Britain – and they shared in the use and ownership of the Corporation’s lands and properties. Such was the quality of the Charter that set up these provisions that the Corporation has survived throughout history right up to the present day. I am proud to be a present-day member – a burgess – of the Corporation and to be the son of a former elected leader – a Portreeve – of the Corporation. When, why and by whom was Laugharne granted its Charter? The generally accepted view is that Laugharne received its Charter in 1290 and that it was granted by Sir Guy de Bryan as an act of charity to gain eternal salvation. However, the Charter itself is not dated and there is a curiosity to find out just when it was granted and perhaps to understand why it was granted. EV Williams MA (Jesus College Oxford) was Portreeve during 1942/43 and wrote what is to date the most detailed account of the history of the Corporation. His researches lead him to suggest the date of the Charter was1307 although he also acknowledged that an earlier date might be possible. In trying to understand the situation one of the first difficulties has always been in deciphering the genealogy of the de Bryan family. This is due to their unhelpful habit of calling several generations by the same name – Guy. I should mention at this point that there are various ways in which the name can be spelt, as spelling was not consistent during that period. I prefer de Bryan (for obvious reasons!) but this is also the spelling used for Tor Bryan in Devon and Haselbury Bryan in Dorset, both of which were estates granted to the same de Bryan family. William de Bryan is described as the Lord of Laugharne Castle before and after it was taken and occupied by Llewelyn ap Iowerth. From the above it can be appreciated how difficult it is to decide who did what and when. I hope they will forgive me if I refer to them as Guy 1, Guy 2 and so on. This has no historical significance but is less confusing than vague references to Guy the younger, Guy minor or whatever. If Laugharne was granted its Charter in 1290, then this would have been done by Guy 2. In 1290 he would have been a man of 39 years old with a son (Guy 3) of 10 years old. The witnesses to the Charter included Thomas de la Roche (1250 – 1314) Walter Malenfant, who was one of the family from Kidwelly Castle and William and Geoffrey de Caunville both from Pembrokeshire. The date seems to work and there are also two potentially compelling reasons why the Charter might have been granted in 1290. Both of these require an understanding of the feudal system of land tenure prevailing at the time. Under the Normans, all lands belonged to the King. He granted lands to nobles in return for the provision of knights, services at court and so on. The nobles granted lands to knights and vassals in return for services and they in turn granted to people further down the social order. This vast pyramid with the king at the top was not without its problems. For a start, if the King needed to wage war he could never be sure how many knights and soldiers were going to be available at any one time and they were certainly not a uniform fighting force. For sheer convenience, most kings resorted to hiring mercenaries – but this took money. The way the King raised money was two-fold: one by collecting money instead of services from his tenants and secondly by collecting taxes for the ‘re-grant’ of land to a successor on the death of a tenant – a kind of death duty or inheritance tax. In theory this should have worked, but one major problem was that the lines down the ‘pyramid’ began to break down. To take an example, Lord A might grant lands to Knight B who in turn might grant shares to Humble C. But if Knight B died without a will, it meant Lord A could not collect any dues directly from Humble C, D, E and so forth as these were held as being owed to Knight B, now deceased. In an effort to bring some order to the system and eliminate the backlog of litigation arising in the courts, King Edward I introduced the Quia Emptores. This said that the new holder of any land – i.e. Knight B’s successor – would still remain liable for the feudal dues. For Lords such as Guy 2 this stepped up the pressure to maintain accurate and consistent feudal dues to the Crown. However, by granting a Charter to the people of Laugharne, it meant that a single Corporation, rather than various individuals would remain liable for feudal dues – vastly simplifying his own administrative burden. 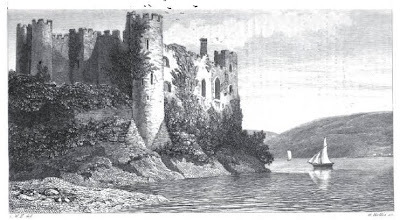 A further consideration might have been the fact that Laugharne remained a strategic target for destruction by Welsh Princes – Guy was 5 years old when it had last been destroyed by Llewelyn ap Gryfydd – and perhaps he felt if people had a greater personal stake in the town they might be more committed to its future defence. The date Quia Emptores was introduced? 1290. Another problem for the King was that some people would grant some of their lands to the Church. Ostensibly this was a means of earning salvation for their immortal souls but the arrangement potentially had a second, more worldly, advantage. If land was granted to the Church then it was granted to God and as God is eternal there was never an opportunity to collect ‘death duties’ on the succession from one holder of the land to another. Now whilst not all grants to the Church would have been a cynical avoidance of ‘death duties’ there was a sufficient incidence of collusion between land holders and Church men that it was a contributing factor in Henry VIII’s dissolution of the monasteries some 300 years later. Back in the 13th Century Edward I made an attempt to tackle the problem by issuing the Statute of Mortmain. This said that no estate could be granted to a corporation without assent of the King. Although aimed at the Church it would presumably also have meant that any grant of land to any corporation – such as Laugharne – after this date would require Royal assent. For Guy 2 he might have felt that in such a turbulent part of the world, it was prudent to grant the Charter before it became necessary to seek Royal approval. The date the final Statute of Mortmain was introduced was, coincidentally, 1290. EV Williams suggested that 1307 was the correct date for the Charter as this was the date when Guy 2 died and was succeeded by Guy 3. Perhaps his views were influenced by the fact that wills at this time were normally made on the death bed. It would have been unusual to make a will in advance. The case against 1307 is that some reports suggest Guy 2 became mentally ill in the years before his death. In this situation perhaps it was unlikely that his will was made at the time of his death. Alternatively, and this is purely speculation, perhaps the will was actually made in 1290 – to avoid the new laws mentioned previously – but like today, was only implemented on the death of the grantor. This would be an equitable solution as it would make both dates ‘correct’. It is worth remembering however that the grant of the Charter did not have to be part of a will and could simply have been made during Guy 2’s lifetime because it suited or pleased him to do so. Suggestions that witnesses to the Charter were already dead by 1307 so the earlier date must be correct must surely be treated with circumspection. Some witnesses, such as Thomas de Roche were still alive in 1307 and it has proved difficult to determine the dates when others died. There has been speculation that the Charter was granted at some time before 1290. The fact that it is undated and carries no seal could point to an earlier date – or perhaps it was an attempt to circumnavigate the legislation of 1290 by simply implying the Charter was of an earlier date. Why would the Charter refer to the Lord Edward and not King Edward? Edward ascended the throne in 1272 so, even had the Charter’s date been deliberately confused, it would still have been possible to imply a pre-1290 date whilst referring to him as King Edward. Given the precision with which the allocation of lands is detailed in the Charter, it seems unlikely that this opening preamble was simply a drafting error. If the Charter was indeed granted before Edward became King in 1272, it could reasonably have been at any time between 1265 and 1270. This was the period when Edward was in Wales working to strengthen control over the Welsh Princes and extend the influence of English Law and Administration on behalf of his father. At this time he could have been described as the Lord Edward without risk of offence to the Crown. In 1265 Guy 2 would only have been 14 years old but three years later in 1268, his father Guy 1 died (aged 53). This event would have given rise to the payment of the ‘death duties’ mentioned previously – unless, of course, the lands had already been granted to a Corporation of the people of Laugharne. A Charter of 1268 would be late enough to warrant mentioning the Lord Edward but not so late as to describe him as King Edward. A Charter drafted when Guy 1 was on his death bed might also explain why it did not show his signature or carry his seal. The rents and dues would still have passed to Guy 2, but the Charter would have avoided the payment of ‘death duties.’ If or when new records come to light then these may be able to confirm the date. There has been much speculation regarding Guy de Bryan's motives in granting Laugharne it's Charter. Whilst it may never be possible to fully understand them, it is perhaps worth looking at the events of the time to see if or how they might have influenced his thinking. 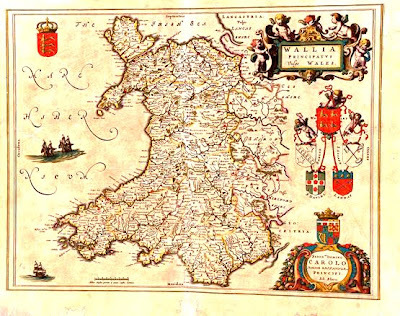 Since the departure of the Romans from Britain in the 5th Century, England was ruled by the descendants of the Angles and Saxons (the Welsh word for English people sais is derived from Saxon) and Wales was ruled by the Welsh kings and princes. Then, in 1066, everything changed. When King Harold of England was defeated by the Norman King William at Hastings, life changed forever for the people of Britain. The Normans introduced the feudal system into England, whereby the King granted tenure of counties to his nobles in return for services at court, the provision of military forces (Knights) or whatever. This filtered right down to manorial level where strips of land would be granted to tenants in return for produce or services such as so many days of ploughing a year. 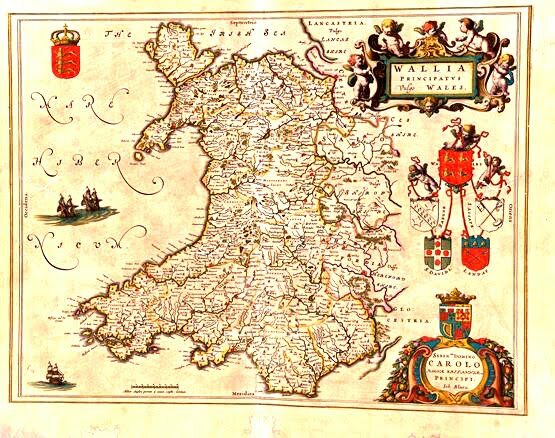 Wales was regarded as a large, empty, hostile country to the West of England. The Normans sought to bring it under control by treaties with the Welsh princes and by establishing Marcher Lordships. These were more closely controlled areas under the power of Norman Lords and covered areas of strategic importance - not just the borders with England but also the ports and routes of communication to Ireland. Not surprisingly, after some 500 years of independence, the Welsh Princes were not too thrilled with this new colonising power and from time to time when circumstances became too intolerable they would rebel against their Norman overlords. The Prince Rhys ap Grufydd who had met Henry II at Laugharne Castle on Henry's return from Ireland in 1172, overthrew Laugharne and Llanstephan Castles when Henry died in 1189. In 1215 Laugharne Castle was again taken from the Norman Crown by Llewelyn the Great (Llewelyn ap Iorwerth) after he had fallen out with King John. Llewelyn allied himself with the barons who forced King john to sign the Magna Carta in 1215. The following year Laugharne Castle was rebuilt by Sir Guy de Bryan (which would account for the Flemish styling). Dafydd ap Grufydd rebelled against the Normans, was captured, and a year later executed at Shrewsbury. The Statute of Rhyddlan extended the rule of English Law to the Counties of Wales - but this did not include the strategically important Marcher Lordships who retained their own autonomy and could choose English or Welsh Laws to settle disputes. Rebellion in South Wales was suppressed by the following year. Guy de Bryan gives Laugharne its Charter which effectively provides self determination for the inhabitants. It is easy to forget that, in the days before rail and road, Laugharne was part of a strategically important communications route. It had a commercial and military significance. The hundred years leading up to the grant of the Charter had been a period of rebellion, war and political instability. Was this the deciding factor in Sir Guy's grant of the Charter? Was he trying to shield Laugharne from the worst excesses of the troubles by allowing self determination? Or was he trying to find a way for Laugharne to run its own affairs so that he could live elsewhere? But these conflicts were not the only factors that might have influenced his thinking. Perhaps in same way that people living in war zones today become desensitised to its horrors, the people of Laugharne had other, more mundane, problems to consider. I shall look next at the legal and financial concerns of the period and how these may have contributed to the outcome. Archaeological evidence suggests the history of Laugharne goes back well before the period of Roman occupation from 43 to around 420. But one of the things that makes Laugharne so different from any other place with an ancient castle is that it received a Charter, a kind of legal proclamation, that changed its status from being merely a village into being a township. So what you may ask? Well, the significance of this is that it made a truly huge improvement to the quality of life of the inhabitants and that this difference was so great it has seen the Corporation (that arose from the grant of the Charter) survive continuously throughout history from 1290 right up to the present day. The Charter was granted to Laugharne by one Sir Guy de Brian, a descendant of one of the Norman nobleman to arrive in Britain during the Norman Conquest in 1066. His Charter to the township of Laugharne meant that, unlike most of the rest of Britain, the men of Laugharne were now free men, that is they were not born into servitude to any Lord of the manor. On reaching the age of 21, they swore (and still do) to serve the Corporation and the Crown, but they elected their own leader, known as the Portreeve, they chose their own committee to decide on the management of the Corporation (called the jury) and, even better, as members (burgesses) of the Corporation they inherited shares in the land of the Corporation to farm and produce their own food as older burgesses passed away. As an ordinary person, being born in Laugharne in the 13th Century must have been like winning the lottery in comparison with other places.